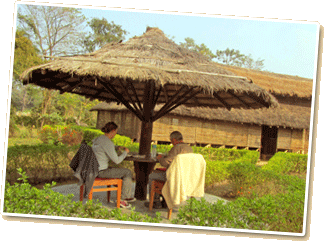 Bardia Eco Lodge is an eco-friendly and carbon-neutral wildlife lodge located in a beautiful riverside setting in Bardia National Park in Nepal, very close to the park entrance. It provides an environmentally sympathetic and sustainable destination for tourists, which also benefits the local community. The lodge has as little impact as possible on the land and ecosystem which it occupies, and indeed to improve wildlife biodiversity in the area. It also strives to minimise negative socio-cultural impacts on the area's local population. The lodge offers a variety of comfortable lodging choices for travellers, and a design that is both functional and tasteful. Bardia National Park is Nepal’s most westerly, and largest of its seven National Parks. An absolute haven for wildlife, the park was originally formed to protect threatened ecosystems and to conserve both tigers and their prey. The park has since expanded to become one of the finest in Nepal. Lush dense forests are home to an incredibly diverse range of flora and fauna. Endangered species such as Rhinoceros, Wild elephant, Tiger, Swamp deer, Gharial crocodile, Gangetic dolphin, Bengal florican and the Sarus crane are all found here. We used a background of formal environmental training combined with extensive travel experience and local knowledge to help us understand the best way to develop the lodge and to understand the economic, social and environmental issues faced in developing countries. Having spent considerable time in Nepal over the past few decades our team are acutely aware of how tourism has impacted the community and the environment. Led by our highly experienced Nepalese team, we have worked together to create what we hope our guests agree is a beautiful lodge in a natural setting where we can maximise our giving and minimise the taking. Keep up-to-date with all the interesting news in and around Bardia Eco Lodge by signing up to our free monthly newsletter.